A continuing advertising campaign can bring instant recognition to a brand’s communications. In an era in which consumers are drowning in commercial messaging and in which a thirty second advertisement is considered long, this could certainly be considered a benefit. However, we are all familiar with the adage “familiarity breeds contempt”. Can a continuing campaign wear out its welcome, with consumers quickly dismissing the communication and tuning out the message because they are tired of the messenger? 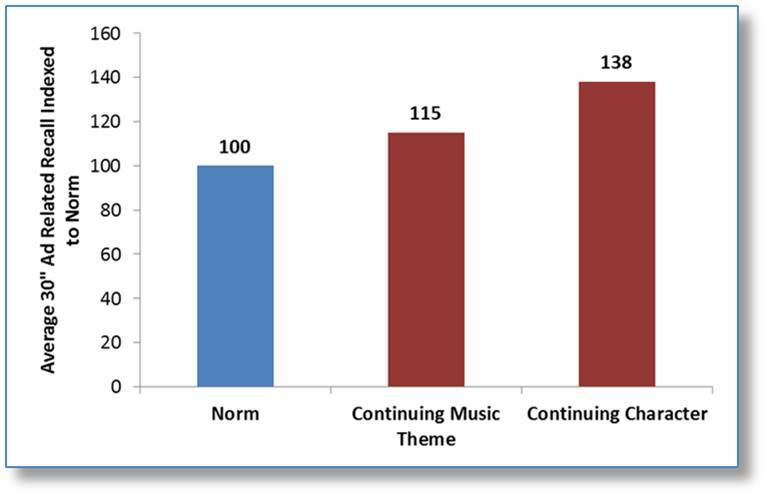 Recognized Continuing Music Theme – Is the music clearly identified with the brand or company? 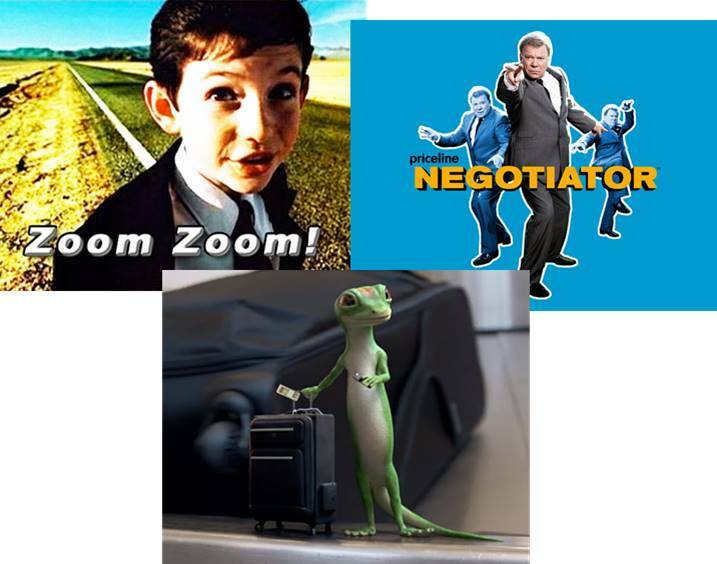 Recognized Continuing Character – Are one or more of the principal or minor characters in the commercial recognized as part of a continuing advertising campaign? Is the character recognized as associated with the product by virtue of previous appearances in commercials for the product? A continuing music theme can be a song or jingle, written specifically for the brand (for example, “I wish I were an Oscar Mayer Weiner” or McDonald’s “I’m Lovin It”) or a popular song licensed for use by the brand (such as Bob Seger’s “Like a Rock” for Chevrolet trucks), as long as it becomes quickly associated with the sponsoring brand. Similarly, there is diversity in the types of continuing character employed by marketers. A continuing character can be an actual person (for example, the Apple Mac and PC guys), an animation (such as Tony the Tiger) or even the personification of the product itself (the M&Ms “spokescandies”). As the campaign becomes entrenched in the minds of consumers, these characters are able to instantly provide branding cues to viewers even before the brand name is explicitly mentioned. And among younger generations, it is likely that William Shatner is better known for his long running campaign for Priceline than for his iconic Star Trek character. While clearly not as agile as a youthful Captain Kirk battling the Gorn, he still leverages his considerable charisma in reminding viewers they can get the best travel deals from Priceline. 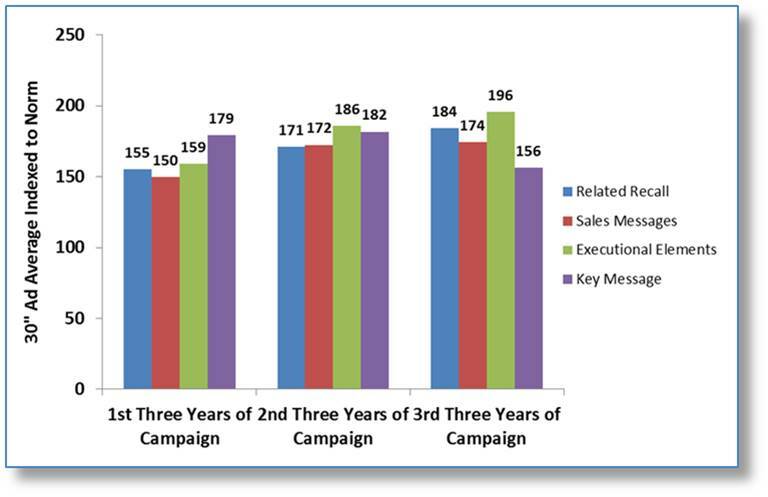 For each of these two types of executional campaign elements, we delved into the MSW●ARS database for empirical evidence for whether, and to what degree, these recognized brand cues can affect the branded memorability of an advertisement. It was found that each is associated with higher related recall levels, with a continuing character being particularly effective in this regard, boosting ad recall to 38 percent above norm, on average. However, while these results show that these branding cues help to capture attention and link the ad to the brand in viewers’ minds, do they also have a tendency to either overpower the substance of the ad or trigger the dismissal of the communication that familiarity may beget? To shed some light on this question we went a layer deeper in the database analysis, examining the different aspects of recall for the ads containing these two content elements. 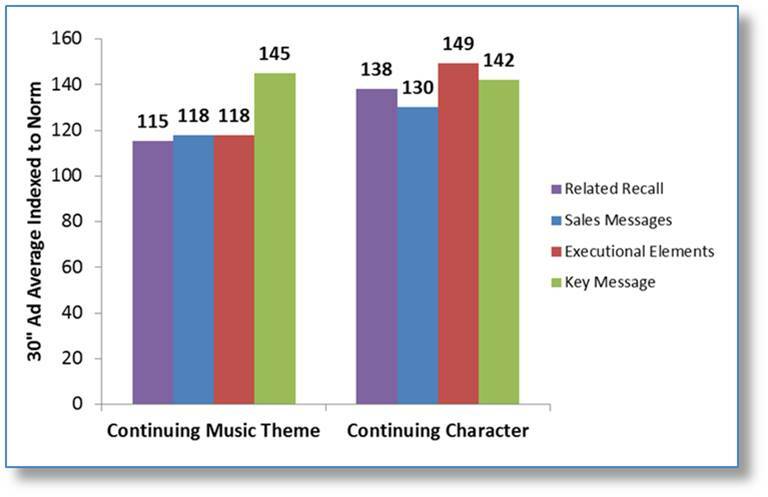 As the following chart shows, for a continuing music theme, both references to executional content and sales messages are elevated to a similar degree as overall ad recall. However for ads with continuing characters, consumer playback of executional content tends to outstrip overall sales message playback – but importantly, sales message recall is still 30 percent above norm, on average. But the big news is that viewers tend to recall the ad’s key sales message at very strong levels for both types of brand cues. It is possible that brands that utilize continuing executional elements are more likely to have consistency in their key proposition, hence easing its communication over time. Or it may be that the instant branding effect of familiar executional elements facilitates communication overall. Finally, we also took an in-depth look at the highly recognizable and ongoing campaign for a CPG brand for which MSW●ARS has tested the television advertising for many years – both before and throughout the current campaign. This campaign uses recognizable continuing characters which have become instantly associated with the brand. 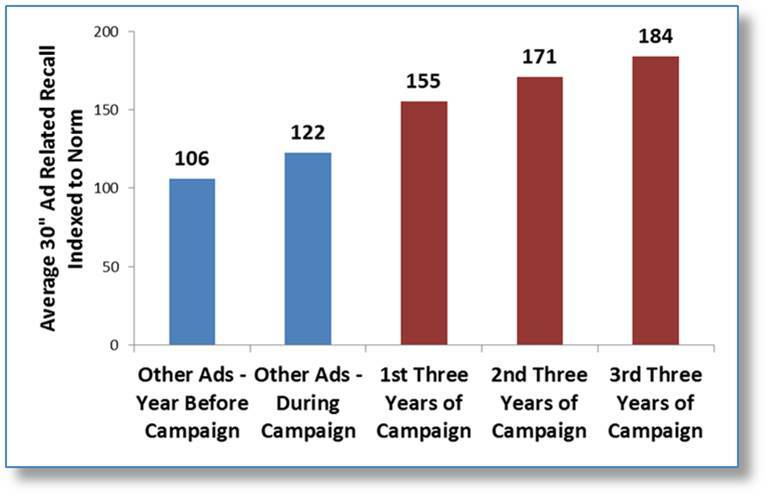 In the year before the campaign started, related recall levels for tested ads were roughly at norm. However, they immediately jumped with the transition to the new campaign. In fact, in the first three years related recall results averaged 55% higher than the norm level. What’s more, levels continued to rise over the subsequent two three-year periods of the campaign. Looking more specifically at what viewers recalled about the ads, we see that growth in playback related to executional elements, surely driven by references to the continuing characters, outstripped growth in overall related recall. However, average playback of the key sales message, which was extremely high in the first three year period, dropped noticeably in the third three year period albeit to an average level still well above norm. While there was consistency in the ads executionally over time, the brand at times shifted focus in its key selling message, often related to the sub-brand being promoted. In the third three-year time period, a relatively large proportion of the ads were focused on two new key sales messages for which communication levels were relatively low. This suggests that brands should use caution when changing messaging within a continuing executional framework, ensuring that the drama supports the intended communication. It could be that use of branding cues, especially continuing characters, may need to be reduced in certain situations – still providing continuity and linkage to the brand but allowing space for sufficient communication and/or demonstration of the key selling message. The bottom line is that use of brand cues such as a continuing music theme or, in particular, continuing characters can be an effective method to boost branding in an advertising campaign, ensuring that viewers link the advertising to the brand. Indeed, in this context familiarity breeds not contempt, but rather enhanced communication. Of course as always, results may vary. But appropriate research can help brands ensure that their advertising campaigns achieve their objectives. Please contact your MSW●ARS representative to find out how our products and research can help to optimize your brand’s communications. Celebrity Advertising – Pitfalls or Payoffs?